Thom Caccamo's vases, boxes and wall works are available for exhibit and purchase. Portland, Oregon artist Thom Caccamo is a builder in clay. His vessels and wall works are all hand built slabs, columns, posts and lintels that take their inspiration from architecture. Piece by piece he constructs geometric forms that are functional and sculptural. If they were at architectural scale they would be monuments but even at the personal size of vessels they remind us of buildings without looking like houses and skyscrapers. Glaze is used sparingly, if at all, to keep the viewer focused on the forms. Instead of glaze the variations of color come from the natural color of the clay and the environment in which it is fired. 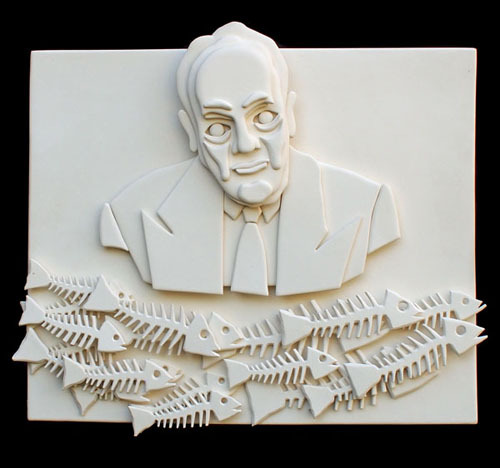 The all white bas- relief wall works take on political and social themes, especially climate change and environmental degradation.